More than 50 million individuals worldwide are living with Alzheimer's disease or a related disorder, and this number will dramatically increase to 75 million in 12 short years and 132 million by 2050 (Livingston et al., 2017; Prince et al., 2013; Prince et al., 2016). Approximately 10 million individuals develop dementia each year globally (one case every 3 seconds) (Prince et al., 2015). In the United States, an estimated 13.8 million individuals will be living with dementia by 2050 (Matthews et al., 2018). Although age remains the primary risk factor, dementia affects individuals differentially, with Latino and African American adults along with women and individuals with low education and financial resources having higher prevalence rates than their counterparts (Matthews et al., 2018). The sheer number of individuals affected, magnitude of disease burden, and negative consequences for individuals, families, communities, and society all conspire to make dementia one of the most feared and important public health concerns of our time (Gitlin & Hodgson, 2018). Addressing this public health issue is contingent upon having the right measures to effectively identify diverse individuals with cognitive impairment and evaluate outcomes of care and services. As measurement informs what we know, what we target, and how we evaluate impact, measurement is the “heart of the matter” in developing comprehensive dementia care. 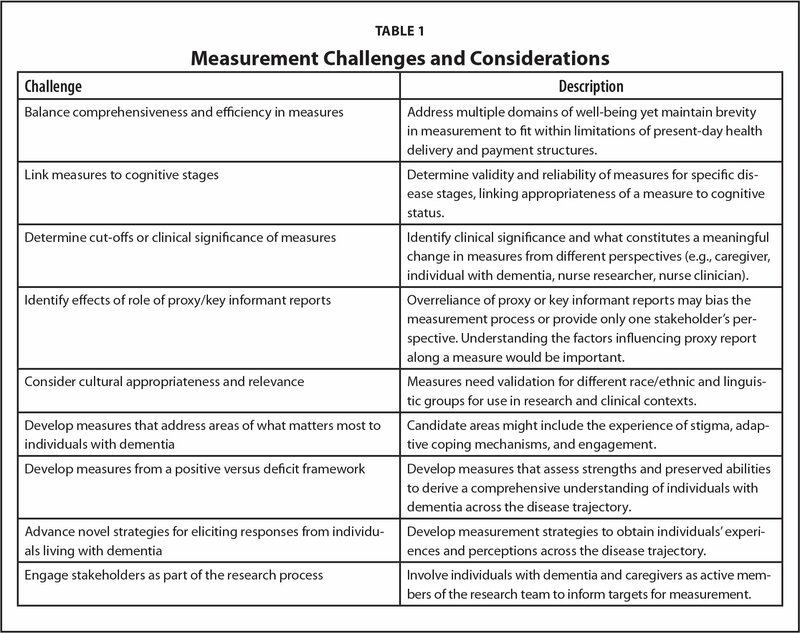 In their State of the Science Commentary, Kolanowski, Gilmore-Bykovskyi, Hill, Massimo, and Mogle (2019) initiated the important conversation concerning measurement challenges that has hitherto been an under-addressed issue in nursing care and research in dementia. Nurses represent a critical stakeholder group in dementia care and are in the forefront of integrating biological, environmental, physical, and psychological data points to understand mechanisms and presentation of clinical symptomatology from which to derive and evaluate tailored treatment strategies. Kolanowski et al. (2019) identify and describe in detail five important measurement challenges to “move the science of dementia care, services, and supports forward” (p. 12). These challenges include: assessment of subjective memory complaints, validity of self-report, ecological validity of cognitive performance measures, use of biomarkers, and variability in measurement on statistical significance. Given the centrality of measurement to dementia care, it is not surprising that it was raised in many of the 12 priority research recommendations from the first National Research Summit on Care, Services and Supports for Persons with Dementia and Their Caregivers (Gitlin, Maslow, & Khillan, 2018). Although it may seem elemental to define, measurement comprises conceptual and operational considerations. At stake in measurement are two essential questions: what should we measure (conceptual) and how (operational)? Summit participants, including individuals with dementia and caregivers, questioned both the “what” and “how” and suggested a transformative approach to the research process in general and as it concerns measurement. As to the “what,” most current measures emanate from specific disciplines and typically adopt a singular focus on deficits and symptoms (i.e., what is no longer). However, other aspects of daily life may factor equally or even more so when developing care and services and evaluating quality of life, health, and well-being (Gitlin, Parisi, Huang, Winter, & Roth, 2016). A deficit model alone leads to care strategies focusing on symptom reduction only. Although symptom reduction is important, a strength-based framework leads to measures that may matter most to individuals with dementia and approaches that support preserved capabilities. Deficit- and strength-based frameworks taken together provide a holistic depiction of individuals living with dementia. As to the “how,” most measures rely on self-report and depend heavily upon proxy, caregiver, or key informants, as discussed by Kolanowski et al. (2019). Novel and different measurement strategies are needed to elicit information from individuals living with dementia themselves, which are valid and reliable at different stages of the disease trajectory. With these points in mind, in addition to the five measurement challenges posed by Kolanowski et al. (2019), nine additional key measurement considerations are described that extend their discussion and reflect a transformative framework for developing measures to support nursing research and care in dementia (Table 1). In summary, Kolanowski et al. 's (2019) commentary rightfully indicates that measurement is key to advancement of the science of dementia care. Two essential questions lie at the heart of the matter: what theoretical frameworks should be deployed to understand dementia and derive care and supportive strategies; and how can we elicit perspectives, emotions, and behaviors from individuals with dementia and across the disease trajectory? Given the magnitude of this public health concern and its differential impacts, measurement development must rapidly advance to make a difference in dementia care. Gitlin, L.N. & Hodgson, N. (2018). Better living with dementia: Implications for individuals, families, communities and societies. Philadelphia, PA: Academic Press. Balance comprehensiveness and efficiency in measures Address multiple domains of well-being yet maintain brevity in measurement to fit within limitations of present-day health delivery and payment structures. Link measures to cognitive stages Determine validity and reliability of measures for specific disease stages, linking appropriateness of a measure to cognitive status. Determine cut-offs or clinical significance of measures Identify clinical significance and what constitutes a meaningful change in measures from different perspectives (e.g., caregiver, individual with dementia, nurse researcher, nurse clinician). Identify effects of role of proxy/key informant reports Overreliance of proxy or key informant reports may bias the measurement process or provide only one stakeholder's perspective. Understanding the factors influencing proxy report along a measure would be important. Consider cultural appropriateness and relevance Measures need validation for different race/ethnic and linguistic groups for use in research and clinical contexts. Develop measures that address areas of what matters most to individuals with dementia Candidate areas might include the experience of stigma, adaptive coping mechanisms, and engagement. Develop measures from a positive versus deficit framework Develop measures that assess strengths and preserved abilities to derive a comprehensive understanding of individuals with dementia across the disease trajectory. Advance novel strategies for eliciting responses from individuals living with dementia Develop measurement strategies to obtain individuals' experiences and perceptions across the disease trajectory. Engage stakeholders as part of the research process Involve individuals with dementia and caregivers as active members of the research team to inform targets for measurement. Dr. Gitlin is Distinguished University Professor and Dean, College of Nursing and Health Professions, Drexel University, Philadelphia, Pennsylvania; and Adjunct Professor, Johns Hopkins University, Baltimore, Maryland. Address correspondence to Laura N. Gitlin, PhD, FAAN, Distinguished University Professor and Dean, College of Nursing and Health Professions, Drexel University, 1601 Cherry Street, Mail Stop 10501, 10th Floor, Room 1092, Philadelphia, PA 19102; e-mail: lng45@drexel.edu.